Machine Learning is rapidly becoming the mainstream and changing the way we carry out tasks. While many factors have contributed to this current boom in machine learning, the most important reason is the wide availability of open source frameworks. ’Open source’ refers to a program that is created as a collaborative effort in which programmers improve the code and share the changes within the community. Open source sprouted in the technological community in response to proprietary software owned by corporations. The rationale for this movement is that programmers not concerned with proprietary ownership or financial gain will produce a more useful product for everyone to use. Framework: It refers to a cluster of programs, libraries and languages that have been manufactured for use in application development. The key difference between a library and a framework is ‘’inversion of control’’. When a method is summoned from a library, the user is in control. With a framework the control is inverted- the framework calls the user. 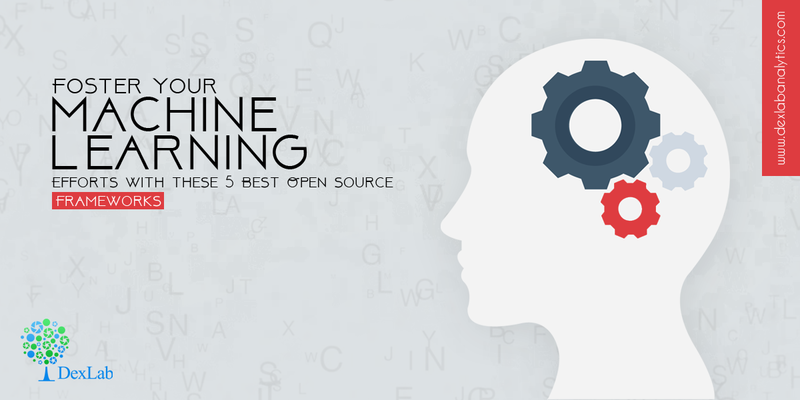 If you are plunging full-fledged into machine learning, then you clearly need relevant resources for guidance. Here are the top 5 frameworks to get you started. TensorFlow was developed by the Google Brain Team for handling perceptual and language comprehending tasks. It is capable of conducting research on machine learning and deep neural networks. It uses a Python-based interface. It’s used in a variety of Google products like handling speech recognition, Gmail, photos and search. A nifty feature about this framework is that it can perform complex mathematical computations and observe data flow graphs. TensorFlow grants users the flexibility to write their own libraries as well. It is also portable. It is able to run in the cloud and on mobile computing platforms as well as with CPUs and GPUs. AML comes with a plethora of tools and wizards to help create machine learning models without having to delve into the intricacies of machine learning. Thus it is a great choice for developers. AML users can generate predictions and utilize data services from the data warehouse platform, Amazon Redshift. AML provides visualization tools and wizards that guide developers. Once the machine learning models are ready AML makes it easy to obtain predictions using simple APIs. Abundant in state-of-the-art algorithms, Shogun makes for a very handy tool. It is written in C++ and provides data structures for machine learning problems. It can run on Windows, Linux and MacOS. Shogun also proves very helpful as it supports uniting with other machine learning libraries like SVMLight, LibSVM, libqp, SLEP, LibLinear, VowpalWabbit and Tapkee to name a few. Accord.NET is a machine learning framework which possesses multiple libraries to deal with everything from pattern recognition, image and signal processing to linear algebra, statistical data processing and much more. What makes Accord so valuable is its ability to offer multiple things which includes 40 different statistical distributions, more than 30 hypothesis tests, and more than 38 kernel functions. These three frameworks have plenty to offer. Apache Signa is widely used in natural language processing and image recognition. It is also adept in running a varied collection of hardware. Mahout provides Java libraries for a wide range of mathematical operations. Spark MLlib was built with the aim of making machine learning easy. It unites numerous learning algorithms and utilities, including classification, clustering, dimensionality reduction and many more. With the advent of open source frameworks, companies can work with developers for improved ideas and superior products. Open source presents the opportunity to accelerate the process of software development and meet the demands of the marketplace. Boost your machine learning endeavors by enrolling for the Apache Spark training course at DexLab Analytics where experienced professionals ensure that you become proficient in the field of machine learning.